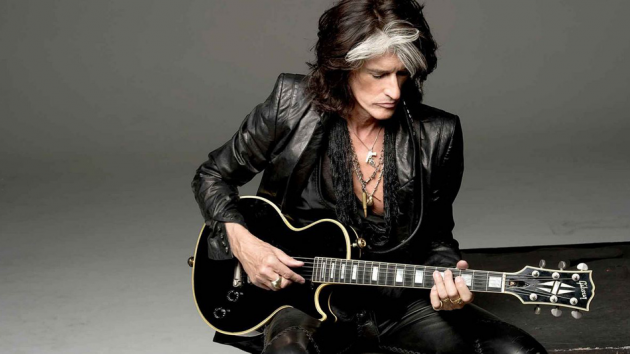 The rocker’s first full studio record since 2009’s “Have Guitar, Will Travel” was recorded at Studio 1480 in Los Angeles and produced by the guitarist and Bruce Witkin, with additional help from longtime Aerosmith associate Jack Douglas, who co-wrote and co-produced a number of tracks. The project sees Perry collaborating with guest vocalists Robin Zander of Cheap Trick, David Johansen and Terry Reid, and others including Johnny Depp, Zak Starkey, and his own sons Tony and Roman Perry. The 10-date fall trek – which will open in Sioux City, IA on November 30 – will see Perry joined a lineup that includes bandmate Brad Whitford and Extreme singer Gary Cherone. A presale is underway for those that subscribe to Perry’s newsletter or follow him social media, with VIP packages available starting October 10 and general public tickets on sale Friday, October 12 at 10 a.m. local time. Perry and the legendary Boston band will host a spring 2019 residency in Las Vegas; "Aerosmith: Deuces Are Wild" will see the group perform an 18-date series at the Park Theater at the new Park MGM resort in Las Vegas beginning Saturday, April 6, 2019. Producer Giles Martin has been brought in to oversee a production that promises “one of the most immersive, state-of-the art audio and video technology experiences in Las Vegas,” featuring never-seen-before content from the band.